An early 90's Asics ad with shots fired at Nike. If you were around in the 1980's and 90's, you know that there were a lot more more major brands, and a lot more competition in the sneaker market than there is now. Advertising was more aggressive back then compared to how it is now, with the major brands often taking shots at one another. Many brands took aim at Nike, who had by the early 90's become the most dominant athletic shoe brand. 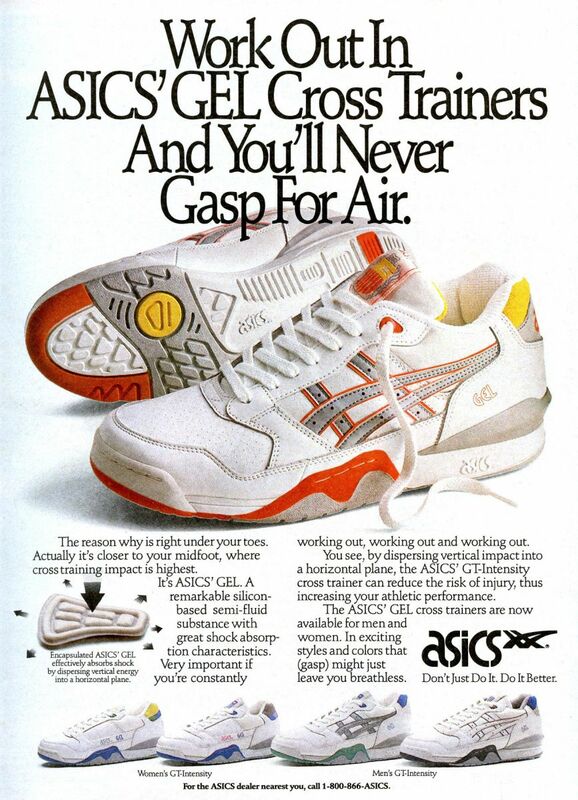 Reebok had the "Pump Up and Air Out" campaign, while Asics had ads like this one. According to its clever opening line, if you tried Asics Gel cushioning, you would never "Gasp for Air" again. It also states, "Don't Just Do It, Do It Better." Ironically, this ad for the GT-Intensity Cross Training shoe for both men and women has a very similar design to most Nike ads of the same time, with a simple white background, paragraph of text, and images of the shoe. Whether or not their ad campaign worked, Asics has survived longer and more successfully than many other brands due to their running shoe line and Gel cushioning, which has many loyal followers.